What's the most recognisable dish that comes to mind when you think of Vietnam? The famous Pho of course?! Pronounced Fuh, rather than Fo - although I never really feel I'm convincing when I say the former. Now, I know I keep banging on about it, but there's obviously a reason for it. It's the perfect meal! Noodles. Soup. Rare Beef. Chilli. These are a few of my favourite things. And I was in heaven when we got the opportunity to make it ourselves whilst in Hanoi. So, here's a slightly modified recipe for you to try at home. Happy eating! Start by chargrilling the onions and ginger for around 15 minutes. Take out and allow to cool. While those are grilling start cleaning the beef bones and sirloin or chuck. Add them to a large pot of cold water (ideally 12 litres - although as you can see the bones I bought didn't quite fit. It took a bit of juggling throughout to try and get as much flavour out as possible) and allow to boil vigorously for about 10-15 minutes. 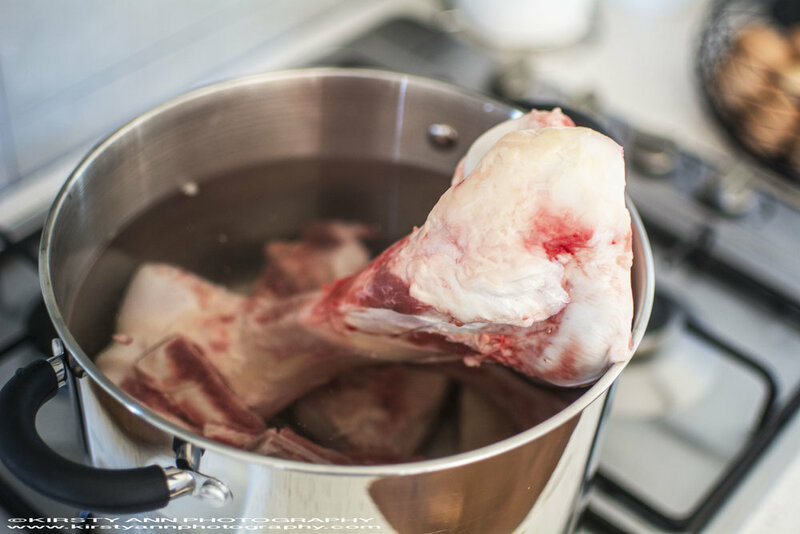 This helps release all the impurities in the bones to make for a clearer and healthier broth. Empty the pot into the sink and rinse the bones with water. Scrub the pot clean and return the bones to the pot. Fill the bones pot with about 6 litres of water and bring to the boil. Lower to a gentle simmer, skimming off any scum that rises to the top (continue this process throughout). 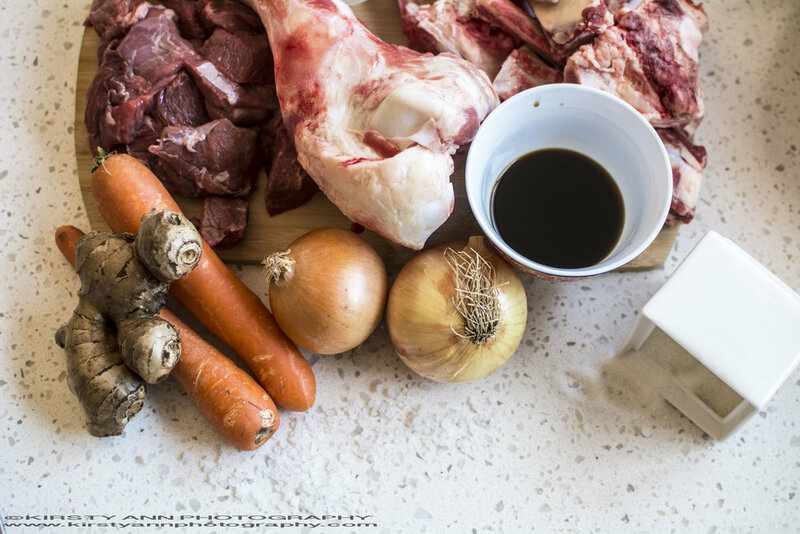 Add the chargrilled onions and ginger, carrots, spice bag and beef chuck to the bones pot once its boiled. Loosely place the lid on the top - Make sure its at least 90% covered otherwise the liquid will reduce too much. After 1.5 hours take out the beef chuck/sirloin and allow to rest. Continue cooking for another 1.5 hours. Remove the bones and spice bag. Add the sugar, salt and fish sauce. Allow to simmer for another 30 minutes. Cut the cooked beef chuck into slices - do this when it's cooled. Freeze the raw beef for at least 30 minutes, then slice it into thin slices. A tip for myself next time is to cut off any fat because it won't cook too well with the broth. Arrange the cooked rice noodles in the bowl and top with the cooked beef, raw beef and the onions. Finish with 2 cups of the broth. Garnish with chilli, lime, thai basil, bean sprouts and a little hoisin sauce. - One of the secret ingredient's used to speed up the process and to add greater flavour is an earthworm. It's not very widely available outside of Vietnam or China. If you do find this delicacy, you'll definitely fork out a pretty penny for it, although you won't need to use much. - You will notice the broth may be oily. Feel free to allow the broth to completely cool and then skim of the hardened oil.